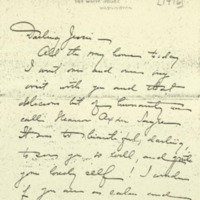 Helen Bones writes to Jessie Wilson Sayre after meeting her new daughter Eleanor Axson Sayre and the family on her return to Washington. All the way home to-day I went over and over my visit with you and that delicious bit of humanity we call Eleanor Axson Sayre. It was too beautiful, darling, to see you so well, and quite your lovely self! I wonder if you are as calm and at peace with the world as you looked. I can't help wondering whether you just made yourself let me take the baby and hang over her so, or whether you really aren't afraid of having her handled. It was very delicious to be allowed to do it; but I don't want ever to force you to do anything that makes you uncomfortable. Of course your father and Edith were delighted at the reported I could give of you. Your father kept saying, “Bless her dear heart! Bless her!” He wants so to go up to see you, and he means to if he can manage it. He is very happy to have you well and safe, sweetness: you should see the look in his eyes when he talks of you!Ellen looks like a giant child now that I have seen Eleanor, and she seems so unapproachable. I think I enjoy tiny babies a little more than older ones, because they can't object to being cuddled. Of course the older ones are more interesting, but they grow independent so quickly.Jessie, do you suppose you could scare up one of those little snapshots of Francis for your father? He would like so to have one, he says. I was telling him of the likeness I thought I saw to your mother. Bless his old heart!—how I do want to see that boy! He probably would spurn me as Ellen does; but I could adore him from a distance. This letter has gone on long enough! I began it two days ago. Well, your nice big boy is with you now, so I know you are quite happy. Give him my best love and tell him I wish I could see him. But I find my dinner engagements are for Friday and Wednesday mornings, not Monday and Tuesday; so I can't get there till Thursday afternoon, and consequently shall miss the plague-stricken one. (The Howes say Frank accused them of behaving as though he had leprosy.) If I find your father and Edith are to be away for the week-end I may not come up till Friday night, as I do feel slight qualms of conscience at staying away as long as I want to when they are here—simply because Edith asks so little of me. I am awfully glad I came home to for the foolish tea-party, for Mrs. Fendall seemed to have wanted me there. Why she should have cared I don't see, when her house was full to bursting anyhow and your father spent an hour there, beset by the entire gang of relations and strangers alike. Well, I think he actually enjoys it just because it's for Edith he is doing it; and if he enjoys it it can't hurt him; that's my pet theory about things that are an effort. Yesterday Belle Hagner James came breezing along, with her stepson and a friend of his. While the boys saw the White HouseBelle and I visited together; and it did me good to see Belle's happiness. That makes two really happy people I've seen this week, not counting your father and Edith.Colonel Brown, Colonel House, and Mr. Auchincloss, the latter's son-in-law, are staying here in the house. Last evening your father and Edith went to Fort Meyer to dine with General and Mrs. Scott and Colonel House took Mr. Auchincloss to the theatre, to see a wild play. You would have hated it (it was “The Follies of 1916.”), but however I enjoyed it, and that in spite of the fact that I had seen it the evening before with your father, Edith, Mr. Brown, and Mr. Randolph Bolling. Bones, Helen Woodrow, “Helen Woodrow Bones to Jessie Woodrow Wilson Sayre,” 1916 April 6, WWP17532, Jessie Wilson Sayre Correspondence, Woodrow Wilson Presidential Library & Museum, Staunton, Virginia.